To pre-pay or not to pre-pay for gas when renting a car? One question we get asked a lot is whether it’s worth it to pre-pay for the tank of gas when renting a car. At first, blush it seems like something you should never do. 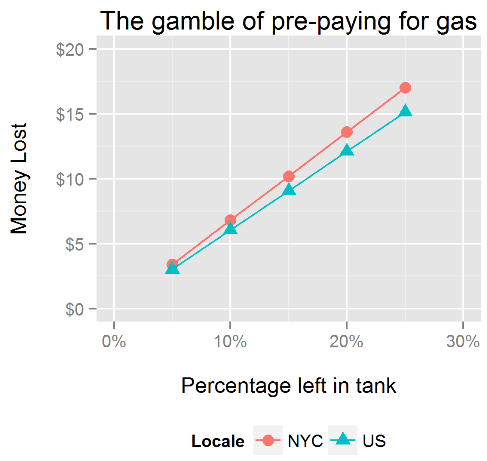 In the best case, you pay market rate for gas, and in the worst case, you pay for a tank of gas you never consume (what if your trip gets cancelled)? At second blush, it can be worth the risk to avoid the hassle of fueling up just before returning the car. If your time and peace of mind are worth something, then maybe you should pre-pay when you are reasonably sure you’ll return it below a certain percentage full. But what percentage? To help with this decision, we’ve calculated the amount of money you waste when returning the car at various percentages full (above). We plugged in the New York City price of gas we face ($4) and the current national average ($3.56). For us, the hassle of refueling in the South Bronx after a weekend in the country is about $5, so we should probably pre-pay when we’re pretty sure we’ll return the car about 5-10% full. It would be much better if you could just pre-pay for a quarter tank instead of a tank. We’d even accept a small fee to do this. Most people who pre-pay are sticking it to their employers. Graphs were made in R using Hadley Wickham’s ggplot2 package. The post To pre-pay or not to pre-pay for gas when renting a car? appeared first on Decision Science News.